Finally have fully started a build I've been planning for a while now. A neck-through electric xii with gold hardware. Almost everything on the guitar will be made by/for me (minus knobs, truss rod, pots, strap pins and tuners, ect). I have a buddy who works at a place that laser cuts sheet metal, so that's where I'm getting the bridge plate, control plate made. That will all get gold plated at a local shop that chromes car parts. I modeled the bridge block, string block, string tree on Sketchup and am having them 3D printed in polished gold covered steel by Shapeways. I'm gonna wind the pickups myself (covers were modeled by someone else on shapeways), and cut the pickguard myself. The body/neck are underway now. Just got the shape rough cut out and glued the neck and body together last night. Now I need to order and wait for a pickguard blank (Tort). Here is the neck: its 5 pieces: curly maple, padauk and walnut. These are the hardboard templates for laser cutting and the plastic pieces are the plastic prototypes for the Shapeways parts. Routing the truss rod channel. It turned out great, which is a relief because in my last few projects I ended up botching and restarting the neck during this step. Cut out the headstock and neck profile with the bandsaw. And here is it all clamped and glued last night. Last edited by SansRegret on Fri Oct 03, 2014 12:41 pm, edited 6 times in total. "Who poured that pint, Ray Charles?" I trimmed the body using a router template I made to it's final dimensions. I ordered supplies so I can start making the pickups today. Gonna start the fretboard (curly maple) sometime in the next few days. Once I have the fretboard cut, radiused, bound and glued to the neck I'll start carving the neck. Still need to get my templates to my friend; if I can't reproduce a bridge nice enough I may end up going with a 12-string tune-o-matic set-up. I have another build to wrap-up and a lap steel I'm working on, and am waiting on parts. This build should pick up in pace soon. For the pickups I ordered alnico 2 pole pieces (0.710"), 42 AWG plain enamel copper wire from Ebay sellers and flatwork blanks from Stewmac. I haven't decided between lacquer potting or wax potting yet. Wow, XII fever is definitely going around! This is going to be interesting to follow! Oooh, yeah, following this one! I've been busy with work (even though we haven't even opened for the summer yet ) and a spring university course. Finally got some work done. A whole bunch of stuff came in the mail (knob for rotary selector, pickup parts, some stuff for other projects and a big bag of nut blanks). I taped the bottom and top bobbin flatwork together then traced the bobbin layout onto them. I drilled all the holes then cut them roughly with a scroll saw. Trimmed them down and cleaned them up with a spindle/belt sander. Assembled them and held the magnets in place with a dab of superglue. I rigged a sewing machine to wind. At first I got lazy and didn't figure out a guide, I tried guiding it completely by hand. I would inevitably wrap over the flatwork and end up breaking the wire. This took forever and I ended up screwing up my first try beyond repair, restarting. I actually finished one like this; but after screwing up a second one completely I rigged a guide to keep the wire from going where its not suppose to. It worked well, still need to tension and move the wire sideways by hand though. Finished one like this in about 25 minutes (much better than the 3 hours it took to screw up each of the others). Here it is without the guide, I also had a block of wood taped to the wheel at this point. The whole set up is just a piece of duct tape folded to be doublesided on the 'wheel', with a repair magnet stuck to it, the pickup just sticks on. I can't go full speed or the pickup will fling off, but it can do 3/4-4/5 speed no problem. I use the foot pedal with my hand. The guide is just a brass tube taped to the sewing machine, onto it is 2 tuner bushings taped in the right position to be the guides. Here are the two I have done so far: on the left is the first one, has lots of solder joints; I used superglue to re-insulate the wire. On the right is the one I made after setting up a guide; did it in one go no problem, no soldering I'll probably redo the first one. I really can't find much info on the vintage spec for xii pickups. I know really long magnets (gave up on them), alnico 2, plain enamel wire. I found somewhere they each have 12500 windings. On another forum I found someone saying they are 5.4k each. I've decided I'm not worrying about the resistance being vintage correct (as well as magnet length); I'm winding the bridge pickups to 4.5 and the Neck to 3.90. But if anyone has anymore info, my open ears (eyes). Awesome! Great work thus far! I take it this isn't your first build? Also, Winnipeg rocks. It's my home away from home. ZenJenga wrote: I take it this isn't your first build? Not first, 3rd or 4th I think, definitely the most intensive yet. Man, you guys are so talented on here! i measured everything, and the bridge XII pickups were around 5.05 ohms, and the neck around 4.85. They were not RWRP. Thanks a lot for the info. Mine are pretty close then, bridge are around 5 ohms, neck are at 4.70. -Thickness planed and rough cut out the fretboard (curly maple). -Also cut out the maple pickup ring/fretboard for the lap steel I'm building. 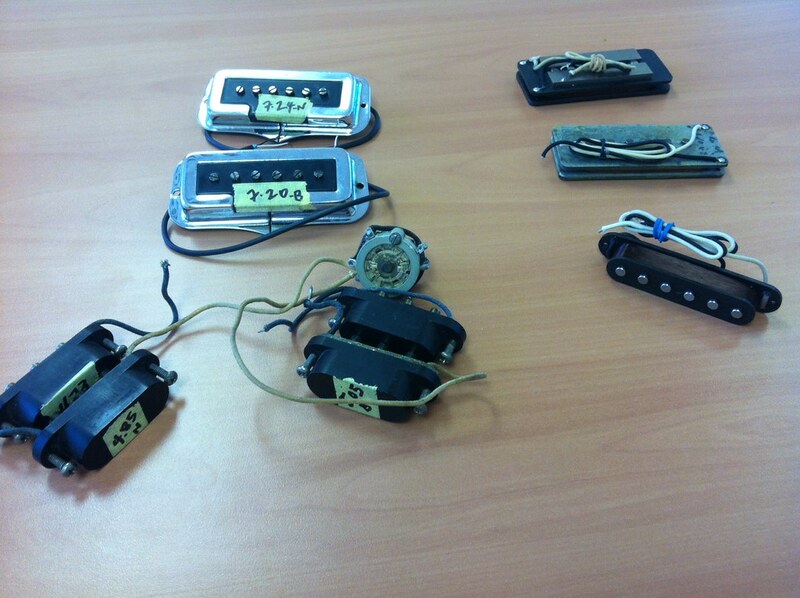 Next up: Attaching the leads to the pickups and potting them. Routing the body cavities, finishing up the fretboard then slotting, binding, black blocks or dots? After the fretboard is attached I'll start carving the neck. Re: neck-through electric XII build - Poll added! No burgundy mist? Following this build closely, cool concept!